Today is a nerve-wracking day. We have a 6 hour climb to Kibo huts, this time through a high-altitude desert, then try to sleep for a few hours before our summit begins. We left behind the groups we had come to know (they stay at Horombo for an extra day of acclimation before going to Kibo) and headed up the mountain. For this route, you can take the upper or lower. Upper is harder, but better views. You also gain altitude quicker. We chose this one – hoping for a couple of extra hours of acclimation before the summit. The landscape changed almost right away in to a desert. 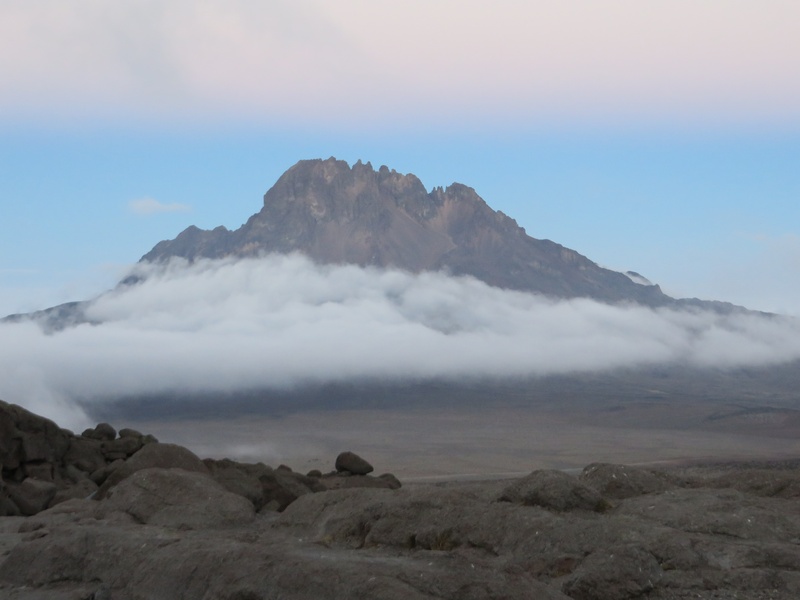 Annnnnd…we finally saw the peak of Kili! Its pretty far up there…and we were already at 12,500 feet. The peak quickly went away behind some clouds, but we finally got a glimpse of what was ahead. 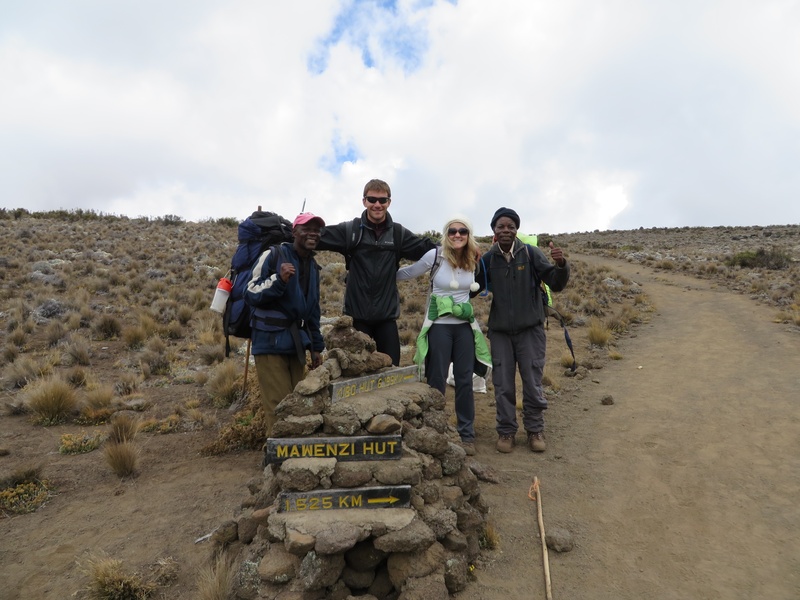 Until now, the groups we were with had been joking that the whole climb was a scam :). Guess it’s real! 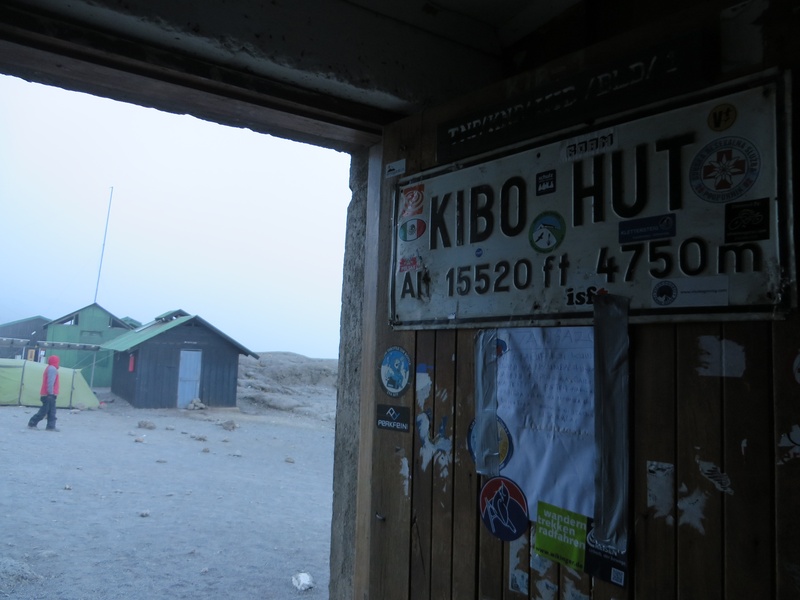 The upper route to Kibo huts goes across what’s called the saddle. 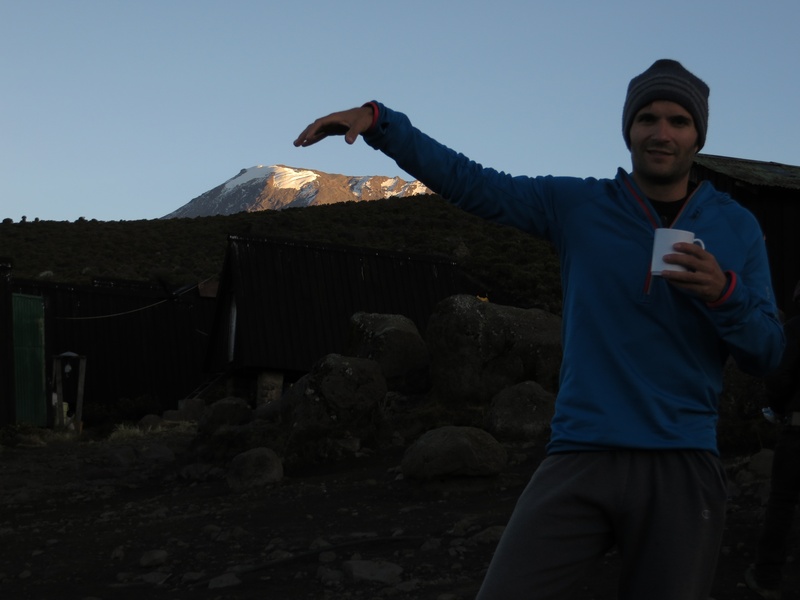 Kilimanjaro actually has two peaks – Kibo (the snow covered one that everyone climbs and is the tallest) and Mawenzi (pretty scary- very high with lots of peaks. Looks like a gothic structure). The saddle connects the two peaks, so once we reached the saddle, we really hiked at the same altitude for about 3 hours. 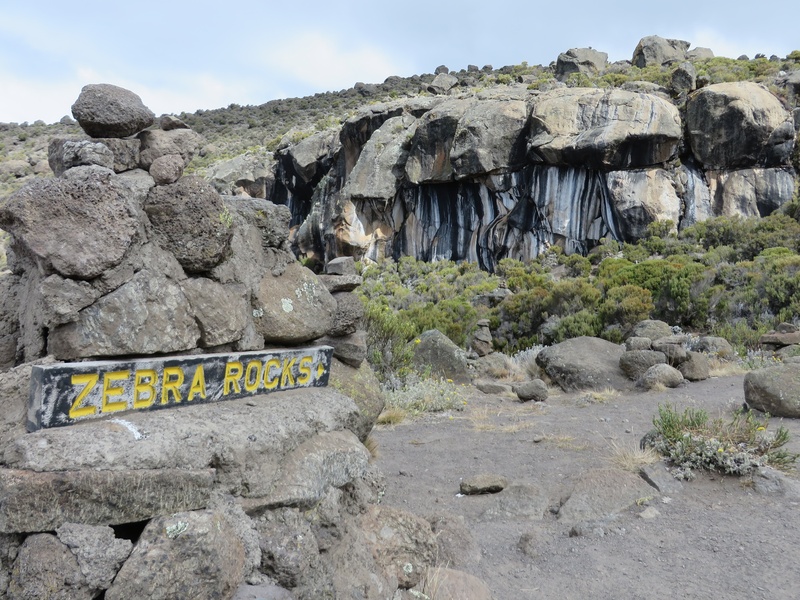 No one climbs Mawenzi – it’s illegal. There’s a good picture of this in a previous post with Brad and Nick next to a drawing of Kili. The saddle is obvious then. Climbing was fine today – none of us have had any altitude issues (besides REALLY bad sleep – we sleep a few hours, then wake up for about 3 hours, then back to sleep) so all went well. We ate lunch on the saddle, and several birds decided to show up. These were huge crows. Many of you know that I hate birds – they terrify me to no end. These were my worst nightmare. We’re hoping it’s not a bad omen, like the black cat we saw when we arrived in Africa! The other weird thing about the saddle is that you can see Kibo huts from about 3 hours away. It’s a moonscape up there – dry and you can see forever. Luckily Desmond warned us of this, otherwise we would have been pretty annoyed. To keep busy, I started counting my steps. Then, I picked a rock in the distance and guessed how many steps until I got to it. Got pretty good by the end! I’m sure that’s a talent I’ll never use again. Brad enjoyed trying to make me lose count. At Kibo, which is basically a cinderblock bunkhouse where people sleep in the same room for a few hours, there isn’t water and the bathroom situation is just terrible. The porters carry water up from Horombo. 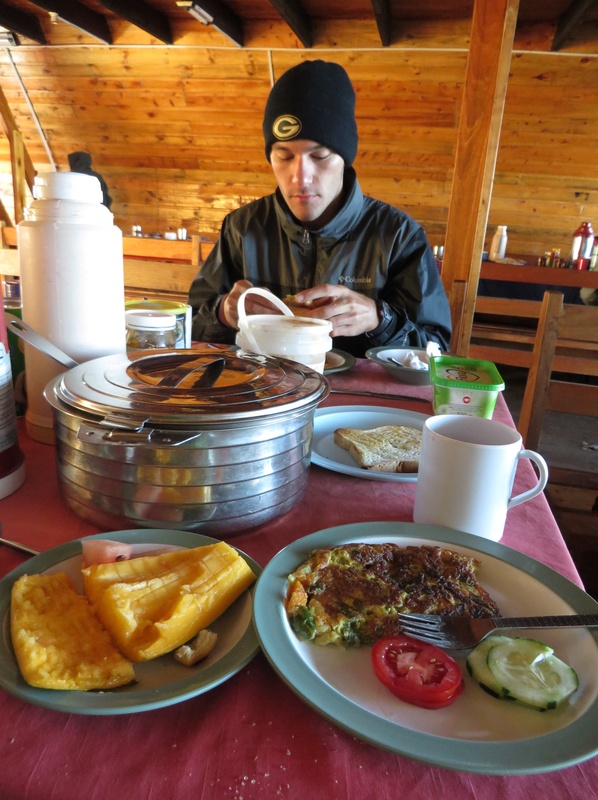 Amazing – we still had our hot water and tea! 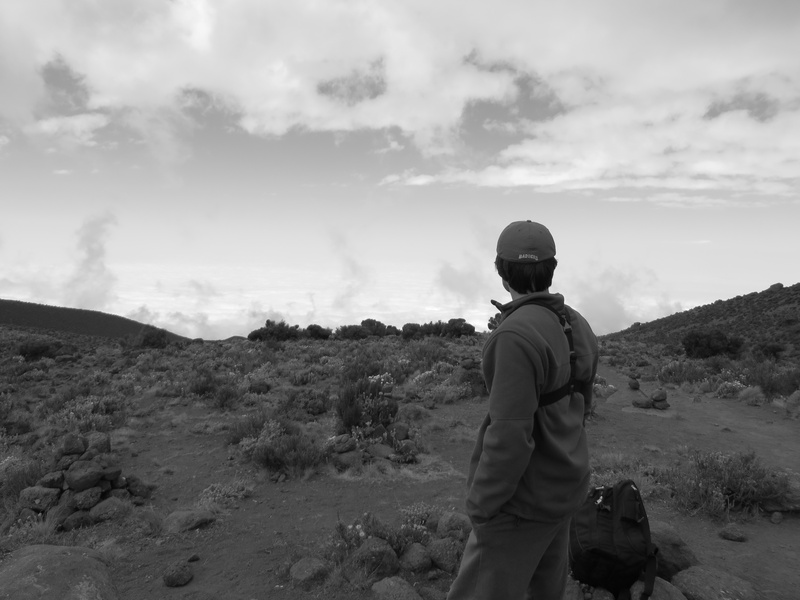 Since Kibo is 15,000 feet, we started being able to feel the altitude here. This would be the place I’d like to spend time to acclimate, but the water situation doesn’t allow that. Dinner was pasta and sauce, then we went to bed around 7 with plans to be up at 11 to get ready for the summit. It’s becoming real – luckily the summit path is hiding behind the clouds so we can’t see what’s in store for us! Weird thing – we have to pee all night up here. That also impacts sleep. You’re drinking about 3-4 liters of water each day, and in altitude your body stores that water. So at night, you finally process it and pee all the time. It’s annoying because it’s FREEZING out. Climbers – be ready for that. It happens to everyone. Alright, time for bed. We saw a guy with an Everest patch on his coat today, so we are intimidated :). He helped me take the picture of Mawenzi below (between the clouds).